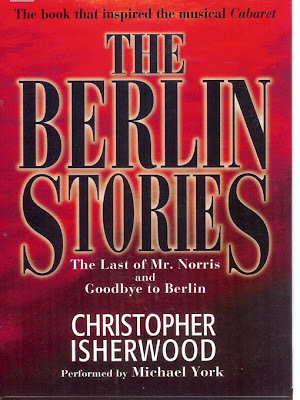 "The Berlin Stories" is actually a loose confederation of two small novels, "Mr Norris Changes Trains" and "Goodbye to Berlin", both written in the 1930s. "Goodbye to Berlin" formed the basis for John Van Druten's play, "I am a Camera" which then morphed into the well-known musical "Cabaret" with the infamous Sally Bowles. 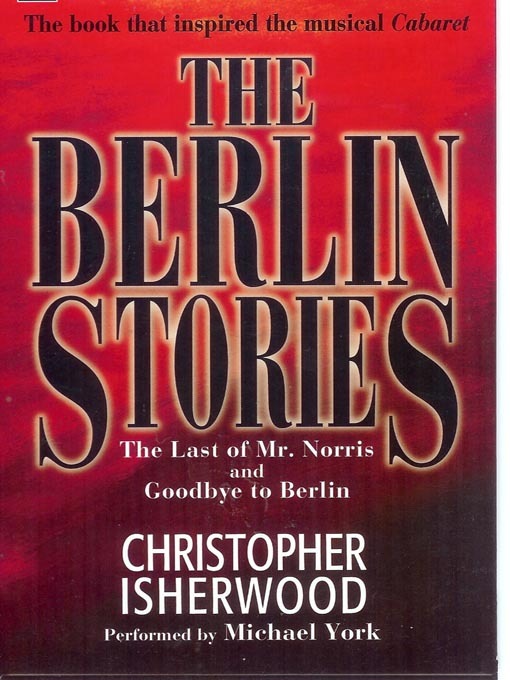 The stories were based on Christopher Isherwood's own experiences in Berlin between 1929 - 1933, the years leading up to the Second World War. 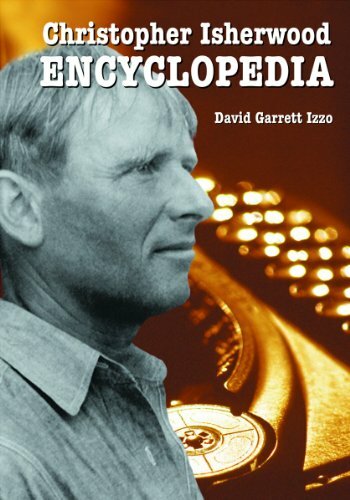 As a homosexual, Isherwood found the city's reputation for sexual freedom alluring. The style is very much that of the camera, the non-participant, the observer, and although the characters are vividly painted there is a sense of alienation that permeates the whole. "The Berlin Stories" seem to suggest that there is a difference between freedom and licence and these stories are a masterly depiction of the magic, decadence, vice and the lost souls in pre-war Germany - a world that was already in a downward spiral. In hindsight this fact seems obvious from these carefully drawn vignettes, and this is in part what makes this contemporaneous collection so compelling. Isherwood was the grandson and heir of a country squire, and his boyhood was privileged. Nevertheless, he suffered the peculiarly English privations of distant parents, boarding school at eight, and the loss of his father in the Great War. In part as a riposte to his family circumstances, he formed, from his earliest years, intimate and creative friendships with a vast range of personalities from all walks and classes of life. With his school and university friend Edward Upward, he devised an imaginary world, Mortmere; its satirical, quasi-surreal mood colored their early work and leached into the writing of their contemporaries. With another school friend, Wystan Auden, he wrote three plays—The Dog Beneath the Skin (1932), The Ascent of F6 (1936), and On the Frontier (1938)—which clothed the psychological and political anxieties of their time in rackety schoolboy camp. Isherwood, Upward, and Auden formed the early core of the Leftist literary thirties generation in England, and they gathered others to them, in particular Stephen Spender. Isherwood tells the story of these culture-shaping friendships in his first autobiography, Lions and Shadows: An Education in the Twenties (1938). In 1925, Isherwood was asked to leave Cambridge University after writing joke answers on his second-year exams. He embraced his dismissal because it set him free from his mother’s straitening ambition that he become a university don. He took part-time jobs—as secretary to a musical group and as a private tutor—briefly attended medical school, and progressed with his first two novels, All the Conspirators (1928) and The Memorial (1932). In 1930, he moved to Berlin where he taught English, dabbled in communism, and enthusiastically explored his homosexuality. His experiences there, notably his friendships with Gerald Hamilton, the real-life original of Mr. Norris, and Jean Ross, the original of Sally Bowles, provided the material for Mr. Norris Changes Trains (1935) and Goodbye to Berlin (1938), still his most famous book. 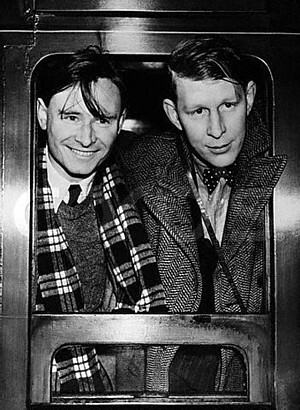 In 1938, Isherwood sailed with Auden to China to write Journey to a War (1939), about the Sino-Japanese conflict. They returned to England by train across the United States, and, inspired by the promise there of professional opportunities and private freedom, they emigrated for good in January 1939. Auden made his home in Manhattan; Isherwood went on to Hollywood to look for movie-writing work. He also wanted advice from Gerald Heard and Aldous Huxley about becoming a pacifist, and, like them, he became a disciple of the Ramakrishna monk, Swami Prabhavananda, head of the Vedanta Society of Southern California. During World War II, Isherwood returned east for some months to work with a Quaker organization in Pennsylvania helping to resettle German-speaking refugees, and then he lived in the Hollywood monastery as a trainee monk. With Prabhavananda, he made a new English translation, published in 1944, of the Bhagavad Gita. He decided not to take monastic vows, but he remained a Hindu for the rest of his life, serving, praying, and lecturing in the temple every week and performing many literary chores for the order, including writing a biography, Ramakrishna and His Disciples (1965). In 1945, Isherwood published Prater Violet, fictionalizing his first movie writing job in London in 1933-1934 with the Viennese director Berthold Viertel. In Hollywood, Viertel’s wife, Salka, an actress and screenwriter, entertained the most intellectual European émigrés, including Max Reinhardt and his sons Gottfried and Wolfgang, Thomas Mann and Heinrik Mann and their families, Igor and Vera Stravinsky, Charlie and Oonagh Chaplin, Bertolt Brecht, the Huxleys, and Greta Garbo. Isherwood was warmly received in Salka Viertel’s salon and for a time lived over her garage. He made large salaries writing for the studios, and he had many love affairs, but he spent the start of the 1950s fighting his way free of a destructive five-year affair with an attractive and undisciplined American photographer, William Caskey. Caskey took the photographs for Isherwood’s travel book about South America, The Condor and The Cows (1947), but Isherwood’s sixth novel, The World in the Evening (1954), written mostly during this period, was less successful than earlier ones. Meanwhile, his close friend, English playwright Dodie Smith (author of The Hundred and One Dalmatians (1956)), challenged another close friend, also an English playwright, John Van Druten, to make a play out of Goodbye to Berlin. When this opened on Broadway in 1951, actress Julie Harris became a star as Sally Bowles, and Herr Issyvoo, first created by Isherwood as a literary device, was launched on a new and vital trajectory of his own. There followed a film of I Am a Camera (1955) and then the Kander and Ebb musical Cabaret (1966), produced and directed by Hal Prince, which won eight Tony Awards and played to sold out houses for nearly three years (1,165 performances). Finally, the film of the musical in 1972 made Liza Minnelli a superstar. She was the first person ever to appear simultaneously on the covers of Time and Newsweek, and the film won eight Academy Awards in March 1973. Cabaret is nearly always in revival somewhere in the world, and a tiny share of the income it generates continues to accrue to Isherwood’s estate, but Isherwood himself was little engaged with the public celebrity it gave him. Something far more important was happening in his private life. In 1953, he fell in love with Don Bachardy, an eighteen-year-old college student born and raised in Los Angeles. They were to remain together until Isherwood’s death. Bachardy had worked as a grocery boy at a Hollywood market and, like Isherwood in youth, spent much of his free time at the movies. He and his mother and his older brother Ted were obsessive fans, and he and Ted learned how to attend movie premieres with the stars they adored simply by slipping over the velvet rope, finding their way to empty seats, and acting as though they belonged; their dark, glamorous looks and sharp dress sense made the illusion utterly plausible. Bachardy’s father worked in the aircraft industry; because he had never finished high school, he was confined to low-paying jobs despite his intelligence and mechanical intuition. He pushed his sons to study hard, and he deplored day-dreaming, films, and Bachardy’s talent for drawing. To ward off criticism and scrutiny, Bachardy always got straight As in school. He studied languages at UCLA and Los Angeles City College and then, returning to UCLA in 1955, changed his major to theater arts. 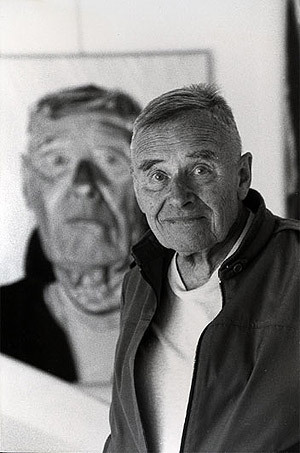 With Isherwood nurturing his dawning sense of vocation, he enrolled at Chouinard Art School in July 1956. During the next few years, he got work as a professional artist, drawing fashion illustrations for a local department store and afterwards for newspapers and magazines. At the same time, he began doing portraits of Isherwood, close friends, and favorite film stars, and to sell his work. In 1961, after seven years with Isherwood, Bachardy left home to study at the Slade School of Fine Art in London, where he worked under Keith Vaughan. He was supported partly by a patron and partly by a job as London fashion illustrator for Women’s Wear Daily. 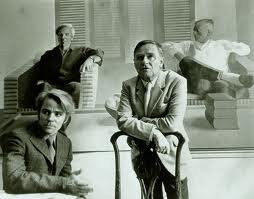 After a few months, Isherwood joined him and completed the final revisions to his new novel Down There on a Visit (1962), four related episodes reflecting past excursions into possible modes of living. Bachardy’s work at the Slade led to his first individual shows—at the Redfern Gallery in London in 1961, at the Sagittarius Gallery in New York and the Rex Evans Gallery in Los Angeles in 1962, at the Santa Barbara Museum of Art and the Stanford Research Institute in Palo Alto in 1963—but there was turmoil in his relationship with Isherwood as Bachardy struggled to establish his own artistic identity and to make an independent life and friendships. He had love affairs to rival those in Isherwood’s past, and Isherwood suffered terrible jealousy and loneliness even though he accepted and encouraged the affairs. Their relationship nearly ended in 1963, and Isherwood moved out of their Santa Monica house. This dark period underpins Isherwood’s masterpiece A Single Man (1964). day-to-day experiences separately in diaries and drawings, and their accounts make clear that conversation between them was penetrating and also funny; when apart they wrote detailed letters. Their life with one another and with their countless friends became a kind of shared artistic project, and their relationship was to become a model for many gay men undertaking long term partnerships in the new openness of liberation. Its iconic status was enhanced by the double portrait of them which David Hockney painted in 1968. In 1983, Isherwood and Bachardy published a month of diary entries and portraits, October, which exemplified their shared impulse to track, examine, and continuously reconsider how to live. Isherwood wrote another novel, A Meeting by the River (1967), about two brothers, one about to take his final vows as a Ramakrishna monk and the other trying to dissuade him, but life itself had become so compelling that he gave up writing fiction and turned entirely to autobiography. In Kathleen and Frank (1971), he drew on the letters and diaries of his parents to explore the mythology of his family background. In Christopher and His Kind (1976), he returned to the 1930s to tell, as a publicly avowed homosexual, the real story of his life in Berlin and his wanderings with Heinz Neddermeyer. The book made him a hero of gay liberation and a national celebrity all over again but now in his true, political and personal identity. His last book, My Guru and His Disciple (1980), records with similar honesty his conversion to Hinduism and his devotion to Swami Prabhavananda. During Isherwood’s final illness, Bachardy drew or painted him almost every day, up to, and even after, Isherwood’s death. A selection of these portraits, among Bachardy’s finest work, was published as Last Drawings of Christopher Isherwood (1990). 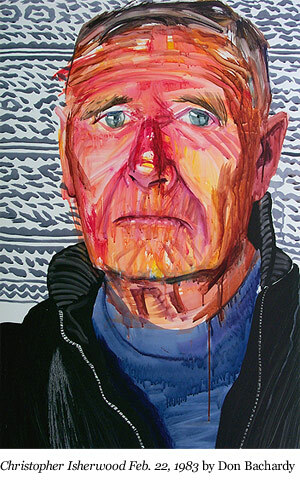 Bachardy has done over 10,000 portraits, and he has exhibited in many cities. His celebrity portraits were collected with selections from his diaries in Stars in My Eyes (2000). His work is held in numerous public and private collections, including the Smithsonian Museum of American Arts in Washington, D.C. and the National Portrait Gallery in London. He appeared in Guido Santi and Tina Mascara’s documentary Chris & Don: A Love Story (2007) and in Tom Ford’s feature film, A Single Man (2009). He has overseen the posthumous publication of Isherwood’s diaries—more than a million words in four volumes—and the current republication of Isherwood’s novels and travel books. Further publications and exhibitions are in train. He continues to paint or draw most days.